Doug Michael & The Outer Darkness - "Outpost" / Hynge - "Weekend @ 911"
I first heard Doug Michael's music when I reviewed the To Jupiter And Beyond compilation in AI #12. His single track contribution impressed me and after dropping Doug a note he kindly sent me these two CD's representing two rather different projects. 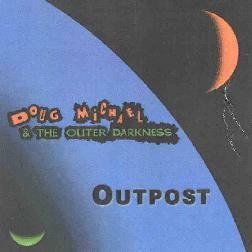 Doug Michael & The Outer Darkness started as a band, but by the time of this recording had whittled down to a solo project with Michael on guitars, keyboards, sequencing, sampling, and drum programming. Imagine Satriani/Vai and Holdsworth/Torn styled guitar rock combined with cool electronic beats and atmospherics and you get something like the music on Outpost. The title track opens the disc with a driving beat, good rockin' guitar licks that carry the tune, and a dark, eerie keyboard background. Somewhat along the Satriani/Vai/Johnson axis, but instead of blowing the listener away with pyrotechnics Michael creates themes and atmosphere to go along with the flash. But Michael can shred too as evidenced on tracks like "Deprivation" and "Scorpion". These tunes are strong on electronics and percussion. On "Deprivation", dark electronic beats, bleeps, and other sounds are led by high-pitched singing guitar licks. Michael's guitar style here and on "Scorpion" reminds me a bit of the late Phillip "Snakefinger" Lithman. "Jungle Baby" is another tune with fiery electro-percussion beats and screaming stretched out guitar licks. "Cover Up" starts as an ambient soundscape piece, but soon develops into something that reminds me of Midge Ure era Ultravox, but with a crunchier heavy rock feel. "Muzzle" is a flash-rockin' tune along the Holdsworth/Torn axis, and with more symphonic prog rock styled keyboards. And "Ghoul" has, as the title suggests, an aura of the macabre surrounding it along with gorgeous wailing space guitar licks that are backed by deep heavy keyboards and organ. Oh man, this guitar feels good! My favorite track. 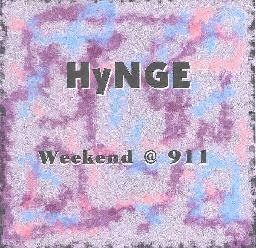 Hynge is a band project consisting of Doug Michael on guitar and loops, Rob Rosen on fretless bass, keyboards, and percussion, and Dan Buch on acoustic and electric drums and percussion. In some ways a power trio version of The Outer Darkness, Michael's Torn and Holdsworth influences are in evidence as the band blasts through a set of rockin', jazzy, ambient, spacey instrumentals. The discs opens with "Detour" which reminded me of King Crimson with a jazzier edge. Buch's drumming is superb and adds an on-the-mark sense of timing and complexity to the music. Michael still rocks hard on the guitar blending elements of Fripp and Steve Morse. "Hologrammatical Human" starts off with an intro of varied percussion and whining extended guitar licks. Rosen's heavy bottom-end fretless soon kicks in and the band settles into a steady groove. Michael gets lots of mileage out of single notes that sing with just as much passion as his more frenzied leads. Lots of David Torn style ambient soundscape licks that go perfectly with Buch's drumming. Kind of like a more rockin' version of Torn's Cloud About Mercury. "Nightcrawler" is another winner that opens with spacey ambient guitar licks, intermittent blasts of Rosen's fretless, and Buch controlling the pace with his drums, soon developing into a steady ambient fusion piece. Like "Hologrammatical Human" this too has great percussion/guitar combos. My favorite track on the disc is "Frank", another track that begins with an ambient fusion feel. Bits of Holdsworth guitar and some Discipline-era Crimson all mix it up and there are some cool freakout moments that showcase Michael as both a proficient and creative guitarist. The pace builds slowly but steadily throughout the song's 11-minute length, maintaining intensity and steady but interesting rhythms. Rock, jazz, and space are all part of the sonic palette on which Hynge paints it's varied soundscapes. In summary, these are both really solid guitar albums that are thoughtfully constructed and executed. In fact, though there are differences between the two I can't really say which to start with first as both seem to go together well as introductions to Doug Michael's work. I hope to hear more from him. For more info on both these discs as well as Doug Michael's other projects you can visit his web site. Contact via snail mail at Doug Michael; PO Box 3166; Antioch, CA 94531-3166.